CAREY — On the second week of football in 2017, the Colonel Crawford Eagles loaded the buses and traveled to meet up with Northern-10 Athletic Conference foe, the Carey Blue Devils. The Eagles would start their N-10 schedule 0-1 after being defeated at Carey; 27-14. Colonel Crawford is 1-1 overall on the season. Crawford would appear to struggle early on the match up and went into the locker room down 20-0 at halftime. In the third quarter, the Eagles defense would blank Carey but only managed seven points on offense. In the fourth, both teams would put seven more points on the board but for the visiting Eagles, it would not be enough. Carey would do a commendable job in shutting down the high-powered Eagles’ running game, holding Trevor Shawber to just 60 yards on 14 carries. Shawber did score one of the two Eagles touchdowns and also had a catch for 20 yards but would turn the ball over on a lost fumble during the contest. Hayden Bute had to throw the ball more than usual as Carey was prepared for the run-heavy offense that he leads. Bute was 10/22 through the air for 142 yards on the night, recording a touchdown and two interceptions thrown. Bute also lost a fumble during Friday night’s action. 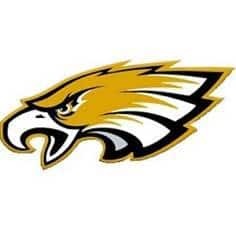 Receiving stats for the Eagles: Owin Seevers- 4 catches, 74 yards and a TD; Shawber- 1 catch, 20 yards; Kyle Shope- 2 catches, 19 yards; Cameron Smith- 1 catch, 16 yards; Kaleb Landin- 2 catches, 13 yards. Colonel Crawford looks to bounce back next Friday when they continue their N-10 schedule, at home, against the visiting Mohawk Warriors.